Tonight the New York Rangers 2-5-1 have their first meeting with the arch-nememis New Jersey Devils 3-4-1, and the first game that Scott Gomez will face his former teammates after the Blueshirts acquired him this summer in free agency. While there's still plenty of season left, Gomez hasn't made much of an impact with his new team so far. He is tied for the team lead with two goals but only has one assist in eight games, contributing to the Rangers' atrocious 2-5-1 start. Let me look at the downside going into tonight's game. Despite a wealth of offensive talent, the Rangers have scored a league-low 13 goals, getting shut out three times already. With one goal in eight games, Jagr is off to the worst start of his 17-year career. Don't look for Sean Avery, Martin Straka and now rookie-superstar-to-be Ryan Callahan as they are all on injured reserve. Callahan is out indefinitely with a sprained knee, grade 2, after crashing into Nigel Dawes during the Pittsburgh loss two nights ago. So we are relying on our veteran lines to get down to business (and Martin Brodeur will be in net for the Devils tonight). Hurrah. On the positive side, Henrik Lundquist is in prime form - despite having only two wins in eight starts, he has a stellar 2.00 goals-against average. The last two games have shown an improved defense - so it appears Renney is addressing one thing at a time. With our offense having a disastrous effort making goals, New Jersey also has had trouble scoring, having been shut out twice while managing six goals in its four losses. So tonight should be a good one - it is a home game, the fans still believe and we are ready for that damn buzzer. Jersey 'on'! In other Rangers news, according to Hockeybuzz, there are plenty of rumors flying that the Montreal Habs and Blueshirts management are in major trading discussions, suggesting that some of the veteran Ranger players are being shopped to add better play makers and add more depth to our blueline. 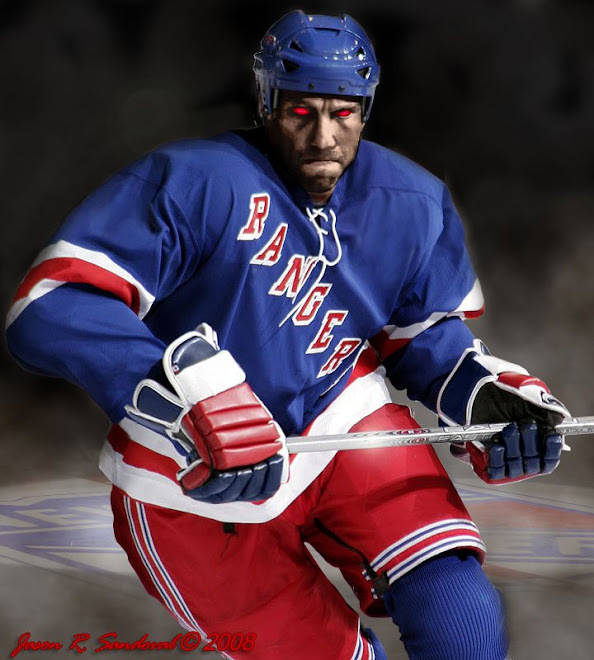 The Dark Ranger knows that NYR owners are not happy with Tom Renney and are prepared to make major changes if the Rangers drop the next two or three games. Hey Mr. Game On!, oh I mean, anonymous. I regularly check in on your site...enjoy it very much. Jags is too good a deal with NYR only covering half of the salary...not sure, but I am afraid Sather will start trading some of the more Ranger refined talent like Callahan or Dubie for more experienced players elsewhere...isn't that his track record? TDR makes a good point... Leave it to Sather to trade some refined (yet moldable) talent in exchange for a "wise", talented veteran -- who for any other squad would be a great addition, but on the Rangers will just be another big name on B'Way. It is my opinion that Shanny did great things for the organization last year. His poise, experience, and positivity -- not to mention talent -- seemed to truly anchor the Rangers. I'm afraid your speculations about him being traded may be right, because of his age and that Sather thinks that Drury can fill his slot... Drury is yet to have proven himself in New York.. Another important fact to point out is that offense wasn't so much of a problem last year, sure the Rangers needed a center -- but they didn't need both Drury and Gomez, especially in lieu of a defenseman. I say trade one of these new acquisitions (as they are both still extremely valuable) for some promising young blueliners... What do you guys/girls think? P.S. Thanks for a great blog! It's tough figuring out who to root for (TDR, look up definitions of root vs. rout? vs. route for your poll) when the Rangers play the Devils. Longing for the days of the one point tie. Go Flyers!